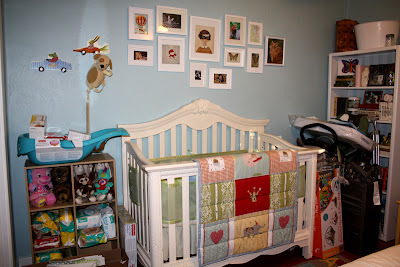 The last few weeks have been busy with preparing for the baby. After our baby shower (which was so cute, thanks guys!) we found that we had more baby clothes than we knew what to do with. We received so many cute baby outfits and hand-me-downs from two friends who recently had babies that we definitely needed a dresser for the baby.........woohoo, painting project time! 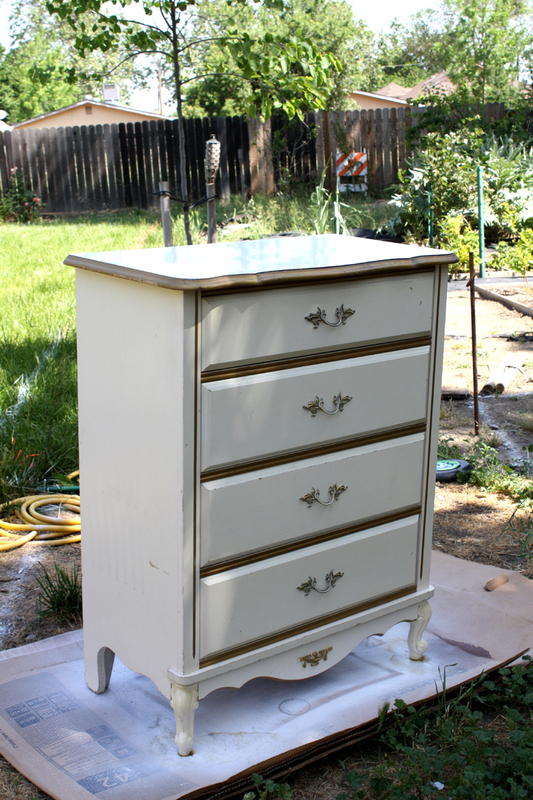 When my parents came up to visit we scoured the local thrift stores to find a dresser. 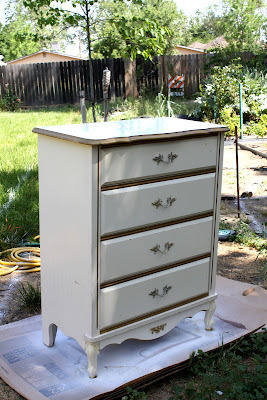 We ended up with one that was the same style as one I grew up with in the 80's, the off white paint with gold embellishment. So, it would definitely be needing a paint job! I got to work removing the old drawer pulls, roughly sanding all surfaces for better primer adhesion and then applying the primer. For the color, I was going to go with leftover Martha Stewart paint in "Peony" that I used on a nightstand already in the room but Brian complained that the color was too much like flesh color, the crayon that you never really used. Personally I liked the color but sometimes you have to compromise so I found a color that was a little darker that Brian approved of, Dutch Boy's "Nantucket Red". 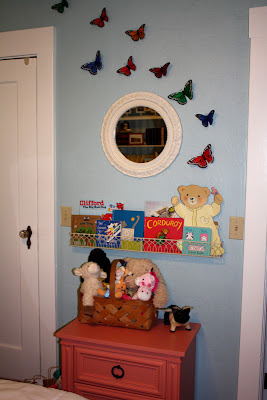 They didn't have no-VOC paint at Orchard Supply where they carry Dutch Boy paint so we went to Home Depot where they color matched it and mixed it up using Behr Ultra's no-VOC paint. I also bought my favorite Martha Stewart pulls that I previously used on our dining room corner cabinet and are using on a project still in the works. 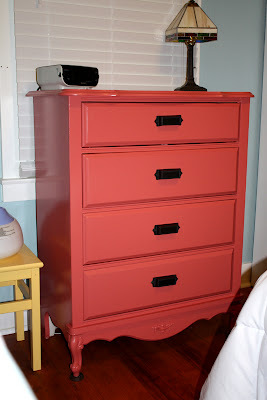 So I applied two coats of "Nantucket Red" and attached the handles and we had a new dresser! We still have quite a bit of organizing to do but here is how things are coming along. We placed the dresser in front of a window with the bunting I made recently. 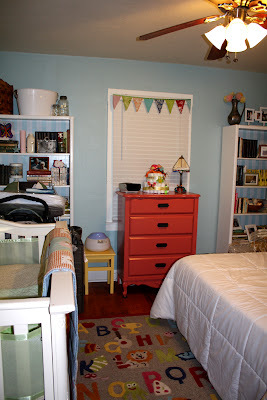 You can also see the alphabet rug that I fell in love with and had to have :o) I still need to re-organize the bookshelves with some baby items and find a new home for our old stuff. One of the neat ideas for the baby shower was to have people sign books instead of cards so the baby has her own library started so I'll be filling the bookshelf with those. 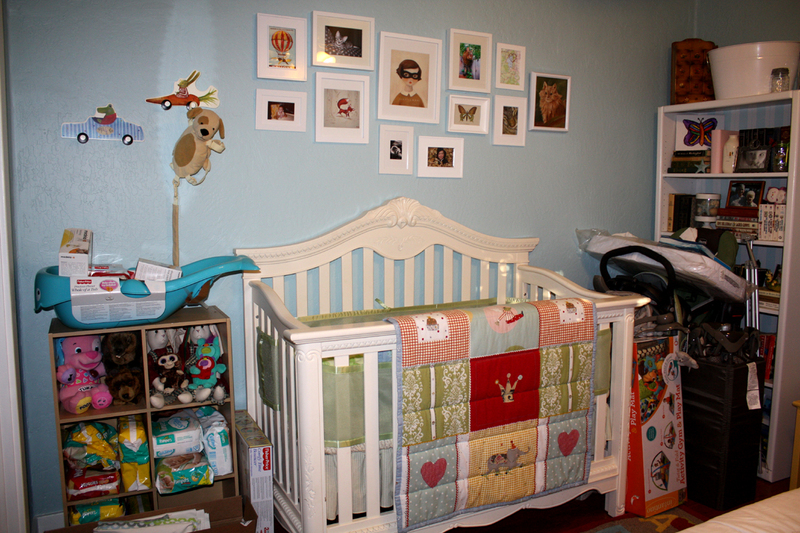 And then we have the crib and all sorts of baby items that need to find a permanent home! So things are slowly coming along but are still quite a mess, but compared to before things are a lot better! Hopefully we can get everything done in the next few weeks before the baby comes! oh i love it! the color and new hardware are so fun! 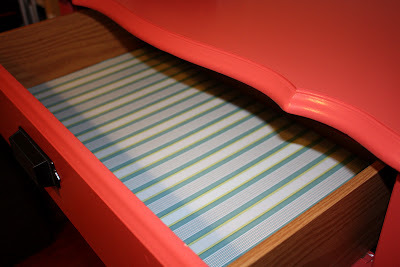 It is a veneer dresser. The paint is holding up well, I just have one drawer that catches a little when opening and closing where the paint has rubbed off a little but otherwise it still looks good!